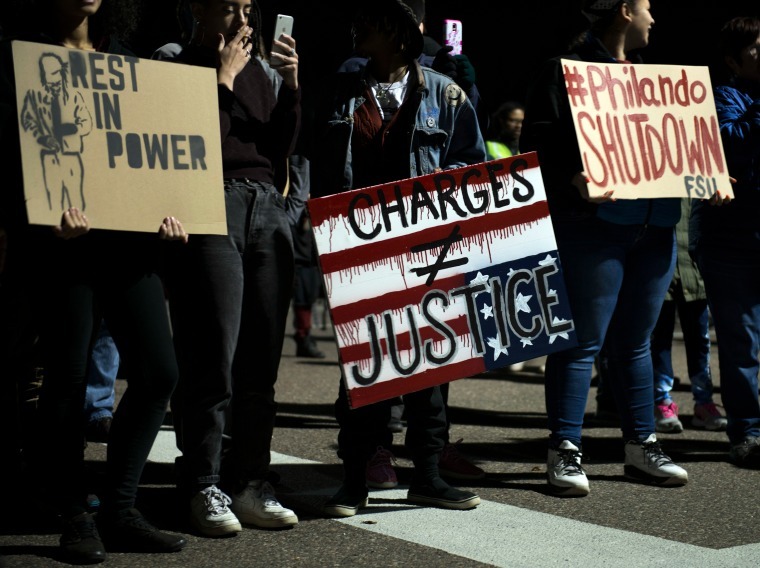 After the officer who shot Castile was acquitted, marchers took to the streets. ST. PAUL, MN - NOVEMBER 16: People gather at JJ Hill Montessori school, where Philando Castile worked, on November 16, 2016 in St. Paul, Minnesota. Stephen Maturen / Getty Images. Philando Castile, was only 32 when he was shot and killed by a police officer in July 2016, as his girlfriend and daughter sat in the car. Castile's girlfriend recorded his final moments on Facebook Live, and anyone with internet access served as witness to the scene. Despite that, the officer who killed him was acquitted on Friday. In response, people have taken to the street. In New York on Saturday, hundreds gathered in Harlem to march for Castile. The follows Friday night's protest in St. Paul, where roughly 1,500 protesters shut down a highway, according to the Pioneer Press. 18 people were arrested in relation to that protest, including two journalists. Footage from the protests can be seen below, as well as Philando Castile's mother's reaction to the verdict.